Traumatic brain injury (TBI) is a public health issue of worldwide proportions, affecting motorists, victims of interpersonal violence, athletes, military service members, and Veterans, among others. 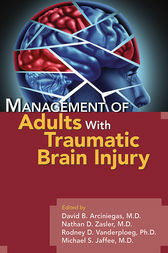 Management of Adults with Traumatic Brain Injury provides evidence-informed guidance on the core topics in brain injury medicine, including the epidemiology and pathophysiology of TBI, the medical evaluation and neuropsychological assessment of persons with TBI, and the common cognitive, emotional, behavioral, and other neurological disturbances for which persons with TBI and their families seek clinical care. Chapters written by an internationally known group of editors and contributors offering cutting-edge, multidisciplinary perspectives in brain injury medicine. Guidance on the identification and management of early and late postinjury neuropsychiatric disturbances as well as their psychological and psychosocial consequences. Identification of special issues relevant to the evaluation and treatment of TBI and postconcussive symptoms among military service members, and Veterans. Discussion of the ethics and methods of forensic assessment of persons with TBI. Key Clinical Points that highlight concepts, assessment issues, and clinical management strategies in each chapter. A wealth of tables and figures to enhance the accessibility and clinical utility of the book, as well as appendices of additional readings and relevant websites for persons and families affected by TBI and the clinicians providing their care. Impressive breadth and depth of coverage, logical structure, clinically rich detail, and concise presentation make Management of Adults with Traumatic Brain Injury a must-read for every physician, nurse, and mental health practitioner working to improve the lives of persons with TBI. Overall this text is a rewarding read and will contribute insights into effective care for individuals with a traumatic brain injury. David B. Arciniegas, M.D., is the Beth K. and Stuart C. Yudofsky Chair of Brain Injury Medicine, Executive Director of the Beth K. and Stuart C. Yudofsky Division of Neuropsychiatry, and Professor of Psychiatry, Neurology, and Physical Medicine and Rehabilitation, Baylor College of Medicine; Senior Scientist and Medical Director for Brain Injury Research, TIRR Memorial Hermann, Houston, Texas; and President, International Brain Injury Association. Nathan D. Zasler, M.D., is CEO and Medical Director, Concussion Care Centre of Virginia, Ltd.; CEO and Medical Director, Tree of Life Services, Inc.; Professor (affiliate), VCU Department of Physical Medicine and Rehabilitation, Richmond, Virginia; Associate Professor (adjunct), Department of Physical Medicine and Rehabilitation, University of Virginia, Charlottesville, Virginia; and Chairperson, International Brain Injury Association. Rodney D. Vanderploeg, Ph.D., is Clinical Neuropsychologist and Psychology Section Leader, Brain Injury Rehabilitation and Neuropsychology, James A. Haley Veterans Hospital, and Professor of Psychology and Psychiatry and Neurosciences, University of South Florida, Tampa, Florida. Michael S. Jaffee, M.D., is Past National Director, Defense and Veterans Brain Injury Center; Associate Professor of Neurology, Uniformed Services University of the Health Sciences, Bethesda, Maryland; and Adjunct Professor of Neurology and Psychiatry, University of Texas Health Sciences Center, San Antonio, Texas.